Just when I was trying to get out..... they pull me right back in. And this little nugget dropped too. I have a small Tyranid force that has been on hold. This may screw that all up. Besides.... imagine the conversion possibilities!! 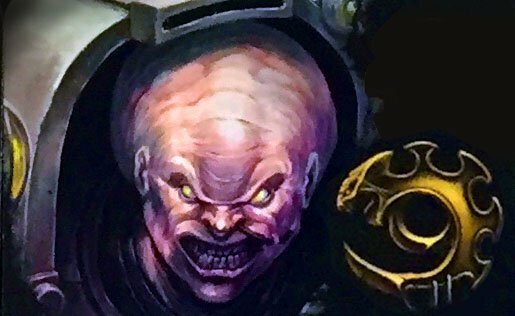 Nothing says you couldn't convert non tyranid minis to stand in for tyranids. From the Workbench: Feathers and something icky. I got some sculpting and construction time in. First, the progress on the Meso-American creep. These are the first (and largest) layer of feathers. I also laid in some fur. More feathers and the headress to come, as well as some skull fetishes. Since its always good to have a couple sculpting projects going at once, so you can let things dry, I also finished up the Sergeant for my Apostles of Quetza Terminator squad. Lots of jaguar fur to paint on this guy. 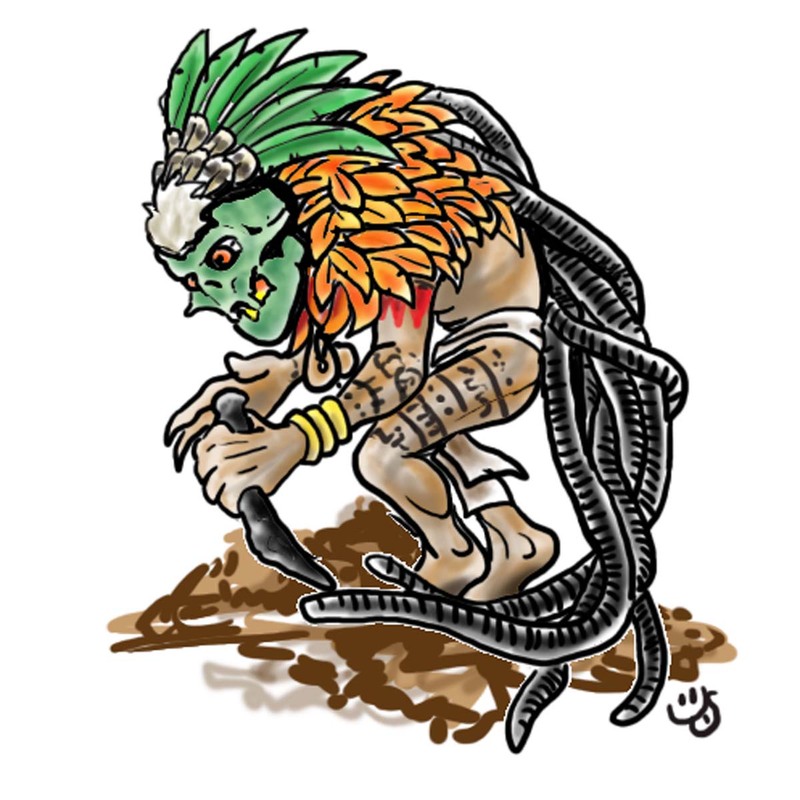 Also did the Quetza snake head. I might add a couple things when I look at him again, but mostly he's ready for priming. Also, did this Tactical Sergeant while waiting for green stuff to dry. 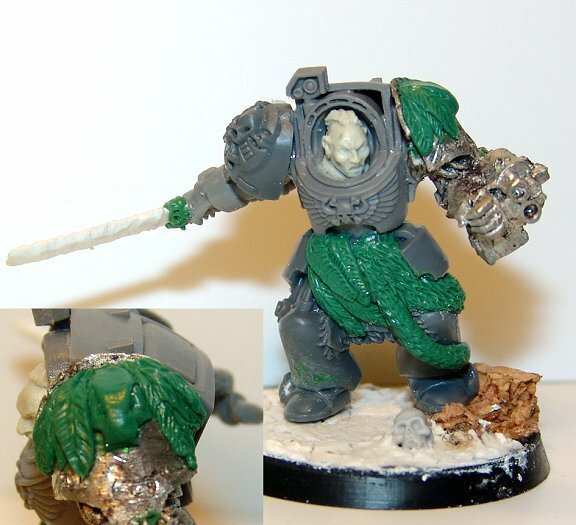 AND.. since I ALWAYS mix too much greenstuff, instead of making cables and such, I began work on another Terminator.... for the Templars of DOOoooom. 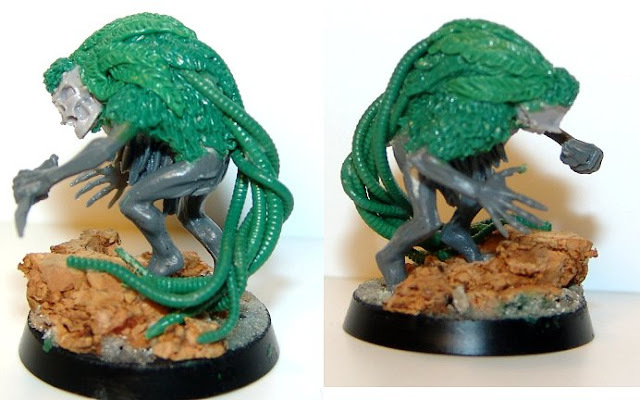 Still quite a bit to do on this guy, but its a start on the hunchback/hive thing. A Quickie and a blast from the past. Not much exciting to report at the moment, unless you want pictures of more cracked bases and mini pieces with the seams scrapped off. There are plans for sculpting and such later tonight, so there will be something substantive in a day or so. But, I stumbled on this picture. Its the first marine squad I painted in 1992. My college roommate still has them, so here they are. Its neat to see how far things have come. 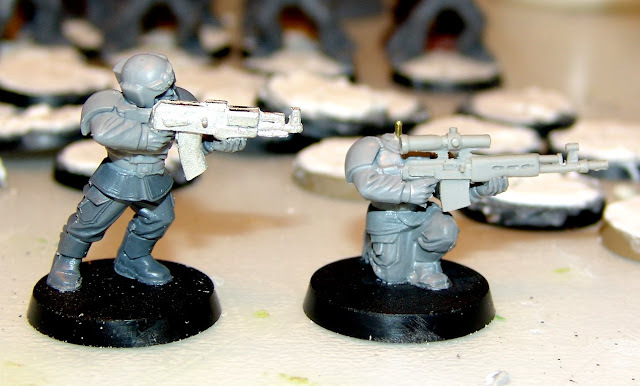 A quick shot of the trial models with the new weapons for MaxMini. Still trying to decide if I want to order more heads.... thus the Dragonov guy is headless. I goofed around with making a greenstuff mold for ammo packs, but they'll fit better if sculpted for the individual models/poses. 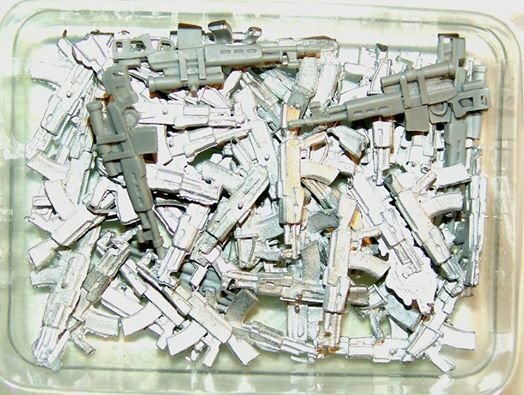 I'll be sculpting ammo packs, so that should drive me down the road to insanity at a slightly increased pace. I mean, its only 30-40 miniatures... what could go wrong? More to come. Cheers ya'll! I'll put a couple test models together tonight. Giggity! Its all about the bases.... and a creep. 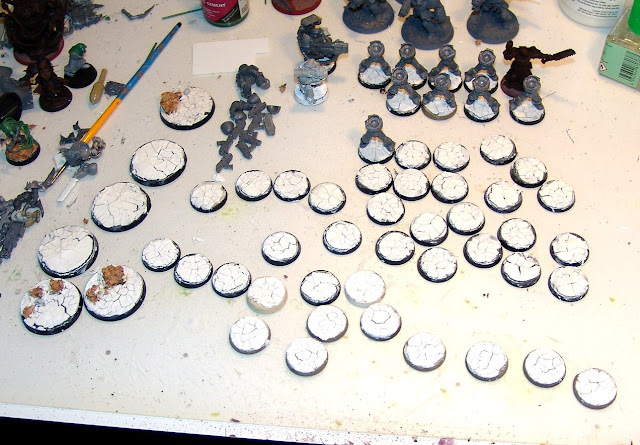 Not too many exciting things in my hobby world, except getting bases ready for the rest of the Apostles of Quetza. 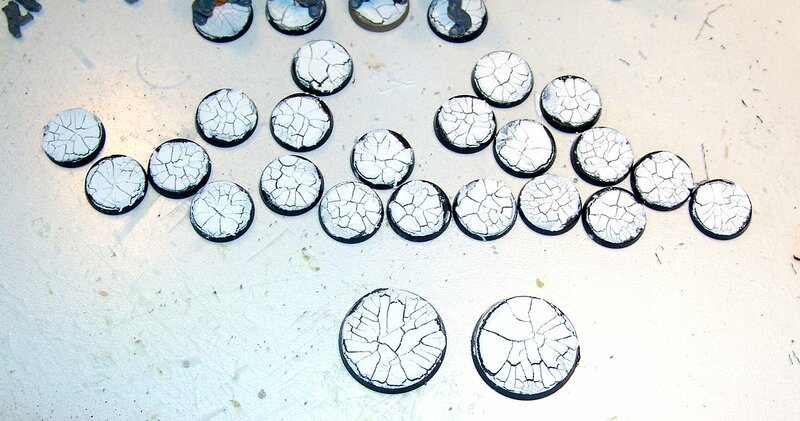 Crackle medium deployed on the bases I should need. I let it dry overnight then secure it to the bases with a couple coats of matte medium slightly thinned. 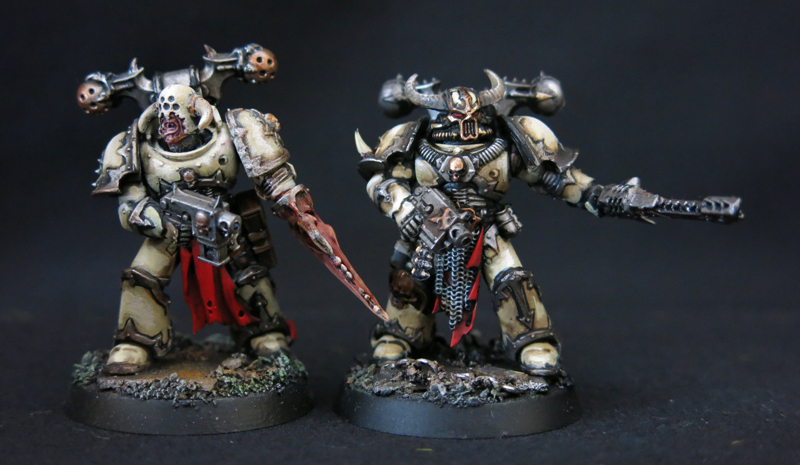 If you don't the chunks come off, but the cool part about them moving around is that you can fix them with the matte medium in slightly different format. I'm thinking this stuff would be great for making those lava bases so many folks are fond of. Hmmmmm... I may just have to do that with some daemons in the near future. Here's a picture of the fruits of my recent tedious labor. I wasn't sure what I was going to do with this guy. 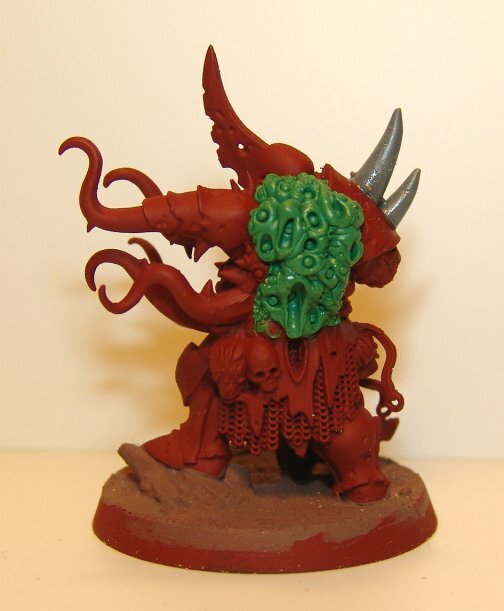 I started him for my Chaos army and then set him aside. So now, I'm thinking about a creepy familiar guy for my librarians. Here's a sketch of what I have in mind for sculpting, etc. Jade mask, feathers headdress, probably feather shoulder cloak. Paint/tattoos all about. 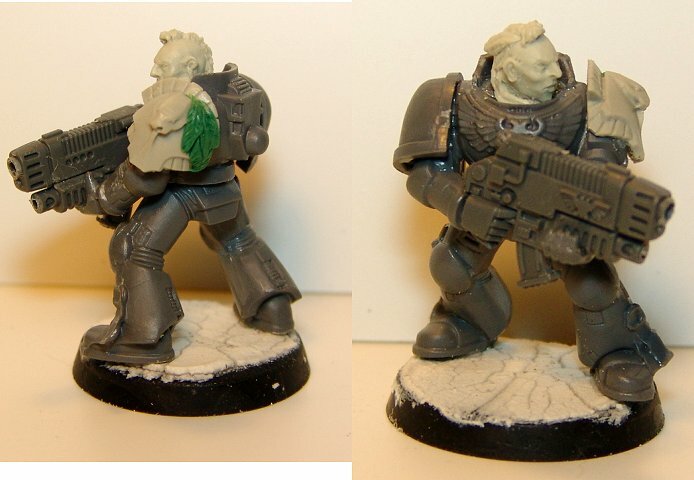 He's going to be a sculpting/paint testing dummy for the details I want to do on the marines. Should be fiddly, tedious and hopefully a good tool for learning. It'd be nice if its fun too.